Our 12 Red Rose bouquet is the ultimate symbol of true romance. 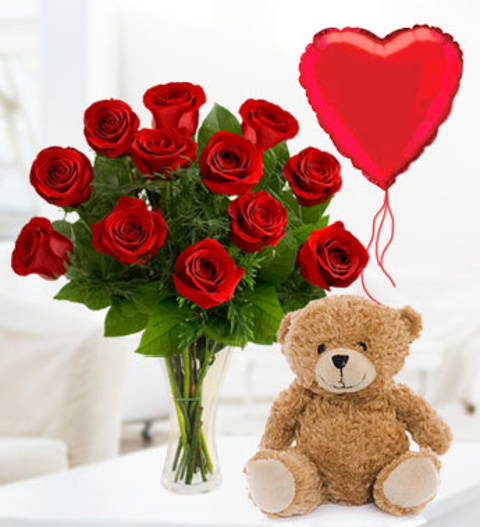 With 12 luscious red roses, it is sure to delight your lucky recipient this Valentineï¿½s. The 12 red rose bouquet is skilfully arranged by our talented florists and comes with a FREE box of fine Belgian Chocolates. Also included ia a love heart balloon and a very cute cuddly bear. The bouquet is available for UK next day delivery. Make Valentines extra special with Prestige Flowers.